Times can get rough, especially during petsa de peligro or that excruciating period before payday. Fortunately (or not? ), it’s a collective struggle among the working class urging some people to be extra creative with food, for example, and share their knowledge with the prudent world. Like this new blog Cheap Chibog. 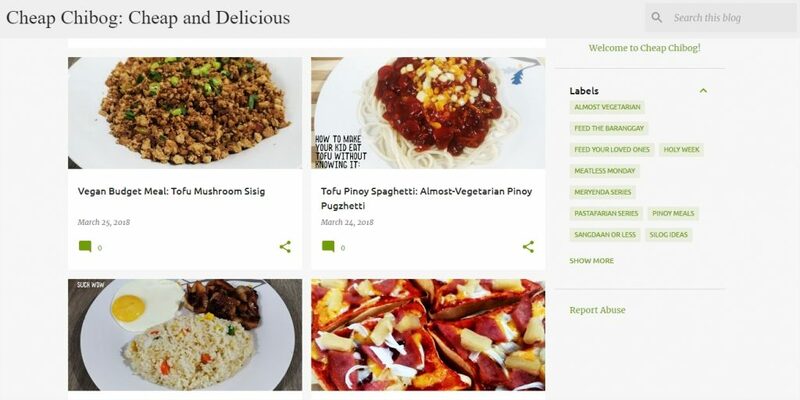 Created just a little over a week ago, Cheap Chibog is a blog that caters frugal people or wannabes, petsa de peligro or not, featuring low-cost and easy-to-prepare recipes including videos. It’s mostly targeted to people who live on their own and on a budget. “Mula bata, naniniwala ako na [hindi] sa mga sosyalin na ingredients nakalaan ang lasa ng pagkain. Basta masarap ang pagkakaluto at sakto ang timpla gamit ang mga sariwang sangkap, sure na sure, panalo ang hain mo,” writes the writer on their first post. Looking from the labels on the blog, it looks like Cheap Chibog will have a series for meat-lovers and vegetarians alike—Almost Vegetarian, Meatless Monday, Meryenda Series, Feed the Baranggay, and Silog Ideas among others. As of now, it has five recipes including the tofu mushroom sisig, which feeds three persons generously for under P100. The blogger also plans to write about affordable restaurants soon. I’m crossing my fingers, hoping the blogger won’t get tired of spreading the good news.